Welcome to the first post of Insight Observatory's "Featured Deep-Sky Object" series. The purpose of these posts is to share some images of the finest deep-sky objects in the night sky and a few facts about them. All images of these objects posted have been acquired by either Insight Observatory staff members or students utilizing remote robotic telescopes. Our "Featured Deep-Sky Object" for this post is NGC 3115. Also called the Spindle Galaxy or Caldwell 53, NGC 3115 is a spiral galaxy located in the southern hemisphere constellation Sextans. The galaxy was discovered by William Herschel on February 22, 1787. At about 32 million light-years away from Earth, the galaxy is several times bigger than the Milky Way. It is a lenticular galaxy because it contains a disk and a central bulge of stars, but without a detectable spiral pattern. NGC 3115 is seen almost exactly edge-on but was originally misclassified as an elliptical galaxy. There is some speculation that NGC 3115, in its youth, was once a quasar. In 1992, Astronomers John Kormendy of the University of Hawaii and Douglas Richstone of the University of Michigan announced what was observed to be a supermassive black hole in the galaxy. Based on orbital velocities of the stars in its core, the central black hole has mass measured to be approximately one billion solar masses. 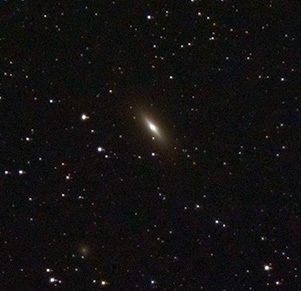 The galaxy appears to have mostly old stars and little or no activity. The growth of its black hole has appeared to have stopped. In 2011, NASA's Chandra X-ray Observatory examined the black hole at the center of the large galaxy. A flow of hot gas toward the supermassive black hole has been imaged, making this the first time clear evidence for such a flow has been observed in any black hole. As gas flows toward the black hole, it becomes hotter and brighter. The researchers found the rise in gas temperature begins at about 700 light-years from the black hole. This suggests that the black hole in the center of NGC 3115 has a mass of about two billion solar masses, supporting previous results from optical observations. This would make NGC 3115 the nearest billion-solar-mass black hole to Earth.